Strawberry crepe cake: it looks so beautiful that people instantly get excited about it! Delicious crepe cake very simple to prepare. 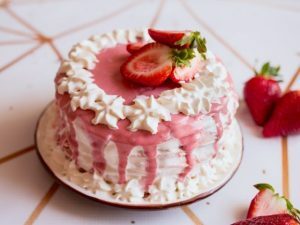 Filled with whipped cream and strawberries, this fancy looking strawberry crepe cake comes together easily to make an impressive and delicious dessert! Whisk melted butter, vegetable oil, eggs and sugar until slightly pale. Separately whisk flour, salt and baking powder. Combine dry and wet ingredients until smooth and thick batter forms. Gradually add milk, while still whisking. Pour some batter onto preheated and slightly oiled pan. Cook until golden on both sides. Let the crepes cool down then cut the to the same diameter. Layer crepes one over another, spreading thin layer of whipped cream on top. The cover the whole cake with cream completely. Make strawberry gello by whisking bloomed gelatin, jam and pink food coloring with war cream. Let cool down slightly. Pour gelatin mixture over the cake, let set and decorate with more cream and fresh strawberries.